Many women - myself included - love bright colours but don't wear them very often. We often end up falling back on trusty neutrals or black/navy - either because we feel that bright colours don't suit us or aren't appropriate for our lifestyles/jobs. Or perhaps the plain truth is that sticking to a small palette of "safe" colours/neutrals is much easier - you're thus far less likely to open your closet door in the morning and realise that although you've got loads of clothes, you can't wear any of them because the *one* garment that would have pulled the diverse colours together and made a credible outfit is in the wash, or at the dry cleaner's. Thankfully, there is a way around this problem. If you like colour and lots of it, then wear it - but let your bag be the item that's colourful, not the rest of your outfit. 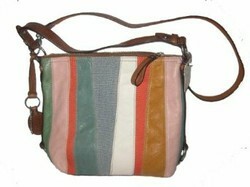 And if you don't want to commit yourself to one colour, then go for a patchwork bag! 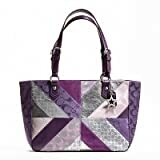 A patchwork leather bag, to be exact - there are well-made and on-trend patchwork leather bags out there which will last you for years and give you the fashion equivalent of a shot in the arm every time you wear them. Before you buy a patchwork leather bag, here are some things you might want to think about. If the sky's the limit, then you might want to consider a bag by Coach. This New York-based company has been making high quality leather bags since the 1940s. You can expect to pay several hundred dollars for one of their bags, so it's definitely an investment rather than an impulse buy. The same goes for bags by Coccinelle, which are if anything more expensive than Coach. If you've never heard of Coccinelle, it's an Italian label that was founded in 1978. The trademark style is minimalism and sophistication, combined with high quality materials - ideal for the office or any occasion where you need to look polished. Still upscale but more affordable, there is also Lucky Brand. Their prices start at around $100, and they make jeans, shoes and tops/T shirts too. Another brand, in the same kind of price bracket as Lucky Brand, is Fossil.You might know them better for their watches, but they also do some pretty nifty accessories and clothing too! What style/shape of bag am I looking for? The answer to this question will depend partly on your personal needs, and also whether you like your bags to be in the latest, most up-to-date style. At the time of writing, the "hot" style of the moment is the hobo bag. In case you're wondering what distinguishes a hobo bag from all the other types of bag out there, it's the fact that hobo bags are generally crescent- or half moon-shaped and have a single strap going from one side to the other, which you sling over your shoulder. Patchwork consists of signature jacquard, metallic suede, lurex, and leather. Water and stain resistant fabrics. Tote bags are also enjoying a bit of a fashion moment now. A tote bag is a simple, square or rectangular shaped bag with two short handles, one on each side. It's designed to be hand-held rather than slung over your shoulder. Another style of bag (which I personally prefer) is the messenger/satchel or cross body bag. You simply wear it diagonally across your body and then forget about it. Well, not forget about it, but other than opening it to take stuff out or put stuff back in, you can pretty much leave it where it is - no having to contort your shoulder in order to keep it in place! A much more comfortable style of bag, provided you don't try and put everything except the kitchen sink in there!